​The Marketing Version of SMB Webworks is designed to provide a low cost, yet powerful online marketing solution that is user friendly for both website visitors and small business owners. With this version, you'll be able to easily publish copy, images, videos, testimonials, blog articles, photo galleries, slideshows, contact forms and much. much more from a super easy to use WYSIWYG interface. Our low cost web design services don't mean cheap website design services, but rather a professionally designed website that is scalable and designed to grow with your business. With the ability to update the site at your will, you'll be in control of your online destiny. Website Design Fee: $1,800 billed in two installments: $900 up front and $900 when the site launches (or at 4 weeks from start - whichever comes first. Website Design Fee: $165 per month for 12 months starting on the day the agreement is signed. Website Architecture (Site Map) - We will review the completed pre-kickoff questionnaire and any additional documents you provide, then meet with you to go over them in detail. We will create a draft site map, and consult with you to define the final "go-live" site map. We will deliver the site map to the website designer to incorporate into the site template. * Note - the content management system allows for the adding and deleting of pages, so the go-live site map will only be a guide for the initial deployment of the website. Generally, changes to the site map can be accomplished at any time. Website Design - We will start with a responsive (displays on all devices) content management framework that we will modify with your company’s brand, colors and photography. During the kick-off meeting we will discuss with you design factors such as color, logo, imagery, typography and messaging. We will then create a unique design that will work to deliver the message to your target audience. We will then collaborate with you to tweak the design based on your feedback. We will include up to 20 stock photos from our stock subscription package (non-premium photos) to be used in the design. Once the design is approved, we'll turn it over to the programmer to convert to standards based code and install it onto the web server. Once installed we'll train you how to update the website. SMB Webworks "in-line" WYSIWYG (What You See Is What You Get") website content management system. WYSIWYG (What You See Is What You Get) Content Management System (CMS):​ Easy, Powerful, Drag & Drop Website Editor - Our intuitive website editor powers millions of websites around the world. Content elements, such as text, pictures, videos, and slideshows are easily added through the simple, drag & drop interface of your low cost website. Full HTML & CSS control is also available for maximum customization. Managing your website content is done in real time, right from within your web browser. There's absolutely nothing to install and no upgrades to worry about. Fully Hosted on Our Reliable Infrastructure - We use a rock solid web hosting platform that powers roughly 2% of the websites on the Internet. Your website will live in multiple data center locations to offer superior up-time, response time, speed and reliability compared to most any other hosting option. The data center features a redundant, cloud based hosting infrastructure which ensures optimal performance and provides a fluid online experience for visitors to your web site. With a traditional web host your site shares disk space and CPU power with dozens or sometimes hundreds of other customers on a single server. If one of those websites experiences a notable traffic spike, all websites on the server can slow to a crawl. With SMB Webworks, your website is served across the entire server infrastructure that powers millions of websites and pageviews per day. If your website is featured on CNN.com, it won't cause as much as a hiccup in your site's performance, or the other websites hosted on this platform. Your site loads fast and remains live under any condition. Photo Galleries & Slideshows - It's easy to show off photos in beautiful, professional photo galleries and slideshows. You select the photos to include and we'll make them look great with transition effects, automatic resizing, and a wide selection of different display styles. Video & Audio Players - Upload audio or video files to our multimedia elements and we'll automatically convert them for playback directly from your website. This means that website visitors won't have to download the files and open a separate media player to watch or listen, they can easily view them on your newly designed low cost website. You can also directly embed videos from major video services such as YouTube and Vimeo. Easy Form Builder - Our drag & drop form builder makes it dead simple to gather comments, contact info, and responses from website visitors. We have contact forms, RSVP forms, and surveys already pre-built. We even have a file drop box element that accepts documents, pictures, or other file uploads from your site visitors. Our form builder is flexible too. Customize forms by dragging and dropping new fields (such as text boxes, dropdown menus, and check boxes) into any configuration you need. When a form entry is submitted by a website visitor, the entry is stored in the site's dashboard for you to review. Image. Perfect. 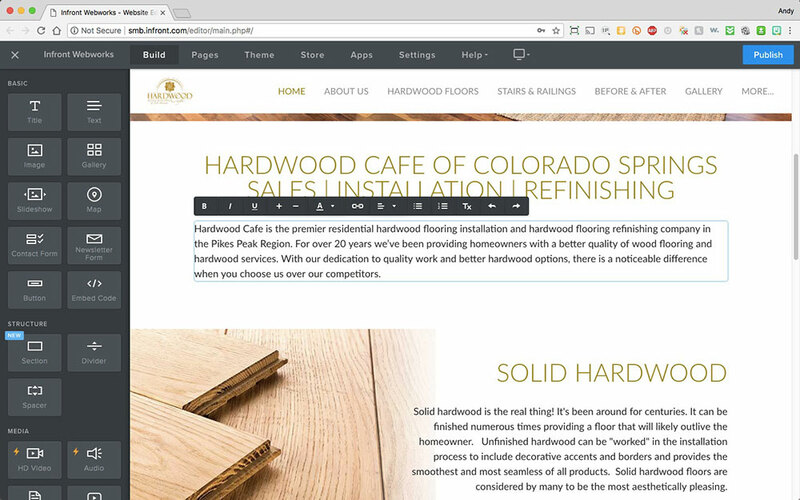 - We don't mean to brag, but ImagePerfect is a feature that really sets this CMS apart from the crowd. ImagePerfect is our fabulous image editing tool that makes it a breeze to crop, resize, fade, and layer your photos. With one click, add stunning photo effects and stylish border designs. The best part - ImagePerfect is already embedded into the CMS, because we believe image editing should be a seamless part of the website building experience. Detailed Traffic Stats - The site traffic dashboard gives you and your clients insight into how many people visited a website, which pages they visited, what search terms they used to find the site, and which websites referred them to your site. Website statistics are calculated in real-time so you can keep a close eye on your data and traffic patterns. For even deeper insights into your website statistics, you can add Google Analytics tracking code as well. Automatic Mobile Site - With the staggering growth of mobile search, it's crucial to have a mobile friendly and accessible website. With our CMS, we create a simple mobile optimized version of your low cost website automatically! The visitors that arrive to your website on a mobile device will be shown the mobile version of your site, while visitors arriving to your website on a desktop computer are shown the full website. You don't have to do anything - it just works! Domain Name Transfer – We include 30 minutes of consulting time to transfer your domain name. Complex transfers may be billed additionally. Content Load/Grooming - We have included time to load and groom up to 8 pages of content in our Marketing Version of SMB Webworks. The training we will provide upon design completion, will give you the direction you need to complete any additional content load. SEO Redirects – If this website is replacing an older, existing website we will create “Google friendly” 301 redirects from old pages to new ones so that you will not lose any search engine equity when the new site is launched. CMS Training - We will provide a single dedicated training session for your staff which should be sufficient to learn the basics of editing content and using the CMS (approximately one to two hours). Additional training sessions are available at additional cost. Ongoing Support – When we launch your new website we want you to be successful, so we will provide you with access to our support team via phone, email or web chat. Our support team will respond within 1 hour during business hours (8:00 am to 5:00 PM, Mon – Fri Mountain Standard Time) and 4 hours during non-business hours. Website Hosting – Hosing makes the website available on a shared www server 24 hours a day, 7 days a week. Includes 24 x 7 access to the CMS, 24 x 7 monitoring and access to our support team, unlimited storage and bandwidth.